Welcome to my first post as a full time blogger for State of Search. In this post, I am going to recap on some of the features within Google AdWords that have been launched over the past year which we should all be considering when managing campaigns in 2012. With Paid Search (PPC) costs continuing to rise, it has become more important than ever to pay attention to how you are managing PPC campaigns. Google AdWords in particular has seen Cost per Click costs increasing significantly over the past year and this is set to continue as more advertisers start joining the PPC marketing game. In addition to rising costs, PPC platforms are continuously adding new features and tools, which we all need to be aware of to ensure campaigns are running efficiently and are not wasting money. Although this was launched in late 2010, I wanted to include this feature within this post as this is definitely one of the tools that everyone should be aware of and using. Automated Rules was a long awaited feature in AdWords that many advertisers have been crying out for and moving forward, I can see this taking the place of some of the bid management tools that are available. 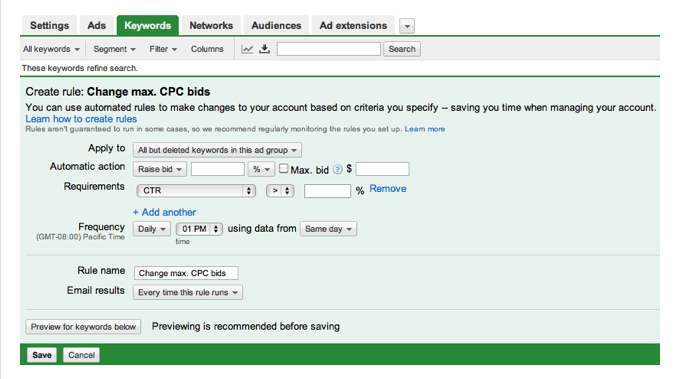 Bid management tools won’t become redundant as they have a lot more uses than just automating rules, but for smaller PPC campaigns, the AdWords Automated Rules feature can really help to optimise campaigns faster. Tip for 2012 – Login to your AdWords campaign and have a play around with the feature, setting up some basic rules until you find your feet before moving onto more advanced rules. You must remember that having rules setup should not detract from your manual optimisation and checks, they should just be used to help you speed up and keep on top of the management. Google announced that anyone using the Conversion Optimiser or Enhanced CPC and have selected Optimise for Clicks within their campaigns will automatically be migrated across to Optimise for Conversions ad rotation and Optimise for Clicks ad rotation in February 2012. They claim that studies have shown that migrating campaigns from Optimise for Clicks to Optimise for Conversions generates an average increase of 5% in conversions. Tip for 2012 – If you have any campaigns that you do not want switched over to Optimise for Conversions, you need to complete this Opt-Out form before the close of play on 31st January. At the beginning of September 2011, AdWords launched Top of Page Bid Estimates which approximates the Cost per Click (CPC) bid needed for your ads to appear regularly in the top positions above the search results. Ads that appear at the top of the results typically get more traffic but this isn’t a target that you should necessarily be going after. Different markets and companies will have different goals and driving more traffic won’t always mean you get more conversions; so think about what it is you are trying to achieve before increasing bids for ads to appear at the top of the page. Tip for 2012 – Monitor the Top of Page Bid Estimates for your keywords and adjust CPC bids accordingly. Product Listing ads were tested in the US for the majority of 2011 and at the beginning of November they were rolled out to the UK, Germany and France. These ads can drive a significant increase in CTR and Conversion Rate as advertisers are able to showcase their entire product inventory to relevant searches. Research and analysis has shown that searchers are twice as likely to click on a Product Listing ad when compared to a standard text ad in the same location. Product Listing ads make it very easy for you to show relevant products that you have listed in your Google Merchant Center to customers that are searching online for the product. You don’t require any keywords or ad text for these ads to run as they are automatically triggered when someone’s search matches an item in your account. At the start of September last year, AdWords announced a change that could significantly affect the vast majority advertisers, the reviewing of paused ads. This means that from 6th September last year, all ads are reviewed by their Quality Control Team even if they are paused; any ads that do not meet their approval are subsequently marked as disapproved. Emails are then sent to the account owner and if the ads are not updated or deleted, it can seriously impact the account. We have had a number of new clients come to us since September that have had their account shut down because they have not paid attention to the disapproved email notifications. Although it can be possible to get your account back on some occasions, Google are really clamping down on the amount of time they have to spend providing administration for accounts and if you lose the account it is very hard to get it back. Top tip for 2012 – Ensure all paused ads are checked and if you no longer need them, delete them! In addition to bidding for clicks, AdWords have now made it possible to bid for phone calls when ads are shown in the Google search results on computers and tablets. If phone calls are a valued lead source for your business, this could really work for you. Some companies are willing to pay more for phone calls and with this feature they could set their phone call bid price at £5 and click bid at £1. Using both features can help to boost your Ad Rank as your phone call bid and phone call Quality Score can directly factor into this. Higher ranked ads are shown more frequently and can therefore drive more phone calls and clicks to a business. Tip for 2012 – If your business values phone call leads, opt in for this and give it a go and monitor the call volume you receive as a result. This is a new feature in AdWords so you do need to keep an eye on performance and stop using if it isn’t suitable for your business. It is only available in the UK and US at present and you will need to use the Google phone call forwarding option to allow you to track performance within your AdWords Account. As most of you will know, there is a huge difference in performance of ads that appear above the search results to those that appear down the right hand side. The top positions will drive more traffic to a site, but this doesn’t necessarily drive more conversions. In July last year, AdWords launched the Top vs. Side Ad Performance Segmentation which allows you to measure results based on the placement position of the ad. I have worked on many AdWords campaigns and have seen varying results so I really do think it depends on the nature of your business and your own goals as to where best to place your ad. Tip for 2012 – Get into the habit of using this segmentation when you are optimising an AdWords campaign and if you see your ads driving good results and margins from the right hand side positions, you can bid down to save costs and increase revenue. Likewise, if it is traffic that you are after, you want to be in the top positions so you can bid higher if your ads are falling down to the right hand side. We all know how much Google love testing and the launch of longer ad headlines came from an experiment whereby they were continually testing variations of the search results to optimise performance for advertisers and searchers. In ads that appear to have a distinct sentence which ends with the correct punctuation, the description in line one is moved to the headline and is separated with a hyphen symbol. This is only available for some of the top placement ads and does not currently impact the results on the right hand side. Their testing found that ads with a longer headline generated a higher Click through Rate (CTR) when compared with other ads in the same position. There is not a settings option that allows you to opt in for this but you can increase your chances of Google showing your ads with a longer headline by ensuring that each line of ad text is a distinct sentence and ends with the correct punctuation. Tip for 2012 – There isn’t currently anyway of knowing which ads were shown with a longer headline, which makes it impossible to analyse performance statistics. I am sure AdWords will integrate some form of reporting at some stage but for the time being, we can write ads with sentences vs. non sentences and measure the results in this way. The launch of Google+ Pages gave businesses another way to get closer to customers online. On 9th November last year, they announced that you can link your Google+ Page to your AdWords campaigns, which means that all +1s from your Page, website, ads and search results get added together and shown as a single total. Google did a study which showed that 71% of shoppers say that recommendations from family or friends do impact their purchasing decisions. Having your total +1 score shown within your ads may potentially result in a higher Click through Rate (CTR) and extra conversions. You can link your AdWords campaigns with your Google+ Page using the Social Extension within the Ad Extensions section of AdWords. Tip for 2012 – Firstly I would recommend setting up a Google+ Page for your business if you haven’t already done so and secondly, link it with AdWords and monitor the results. If social continues to grow as it has been and Google continues to push Google+, then I can see this having a positive impact on AdWords campaign performance. Whoa. I definitely need to up my PPC game. I’m soooo behind. It is crazy how many updates AdWords is getting now! I went to a Product Kickoff meeting at Google this week and there is so much being launched this quarter again, madness. AdWords did seem to introduce a lot of great features last year. With better conversion attribution in Analytics it’s definitely easier to know where, when and how to spend your budget. Really comprehensive look at all the new product offerings. Important for people to note how important the likes of Conversion tracking and Merchant centre is now – New products seem to be focusing on these being a prerequisite. If setting up a Google+ page, it’s really important to share new content on a weekly basis – Encourage engagement and conversations about your brand! 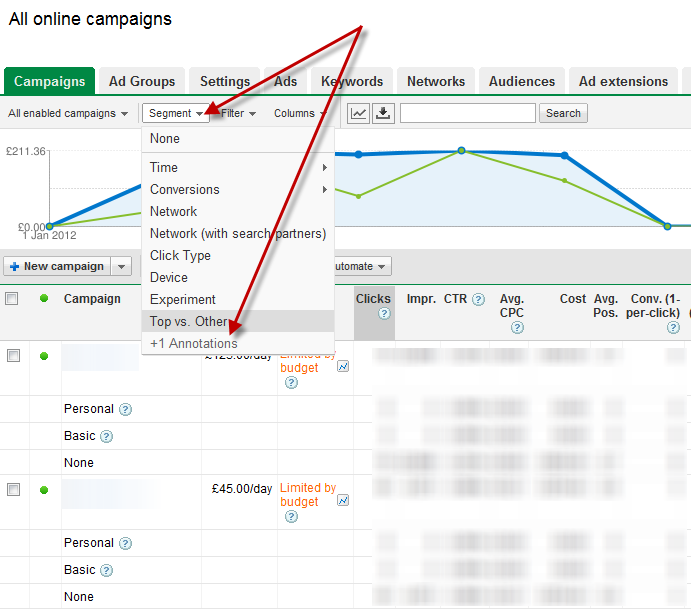 Then linking to AdWords adds far more value. A very useful article as I am about to step into Adwords.